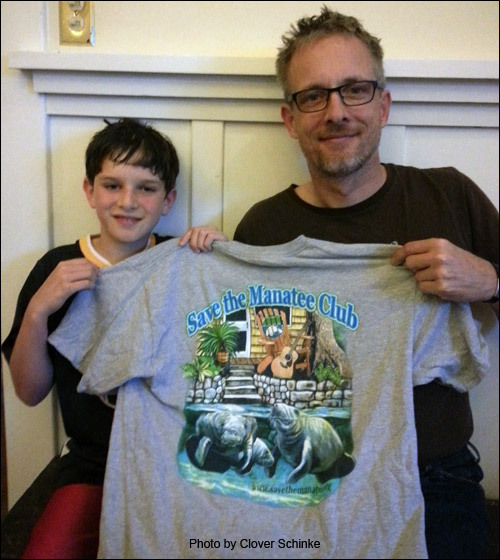 Chris Schinke (with son Baeden) proudly holds up his Save the Manatee Club t-shirt which arrived with his adoption packet for Father’s Day last year. Note: A high resolution jpeg (300 dpi) of a manatee image, as well as a photo of Chris Schinke and his son, are available upon request. It’s easy to make sure Dad has a happy Father’s Day when he receives a gift that he can really care about. Adopt-A-Manatee® for him! For $25, Save the Manatee Club will send Dad an adoption certificate, photo, and known history of a real living manatee. Or for $35, a great-looking Club T-shirt will also be included with the adoption package. 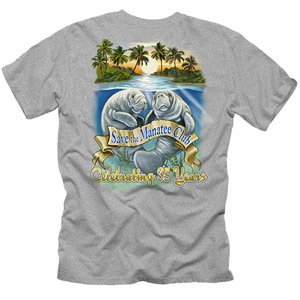 When you Adopt-A-Manatee at $35 or more, you’ll also receive a FREE 35th Anniversary Club T-Shirt. The manatees themselves have become celebrities, especially those in Save the Manatee Club’s adoption programs. Manatees like Howie, a prankster in the manatee world and hugely popular in the Club’s Blue Spring adoption program, has been on the cover of a top-selling magazine. Many others have appeared in articles and been featured in the Club’s TV public service messages. Select from 34 manatees up for adoption including possible favorites for Dad such as Gator, Doc, Rocket, and Brutus. See photos and a list of the manatees available for adoption at savethemanatee.org/adoptees. Whichever manatee is chosen, adopting one helps them all. Funds from the adoption program support Save the Manatee Club’s crucial long-term goals to safeguard endangered manatees and their aquatic habitat. Manatees have suffered significant losses in recent years, particularly from cold stress and red tide outbreaks. Collisions with watercraft continue to be a large known cause of manatee injuries and deaths. Habitat deterioration and loss of warm-water habitat are also major concerns. Save the Manatee Club is a nonprofit conservation organization, established in 1981 by singer/songwriter Jimmy Buffett, and former Florida Governor and U.S. Senator Bob Graham. The Club educates and raises public awareness; conducts research and sponsors rescue, rehabilitation, and release efforts; supports land acquisition and promotes aquatic habitat protection; advocates for improved protection measures; and assists education and conservation efforts in other countries as well. Read about the Club’s many activities and accomplishments.